NWT Cley Marshes01263 740008work Nature ReserveNWT Cley Marshes: Perched on the north Norfolk coast, NWT Cley Marshes has a well-deserved reputation as one of the UK's best bird watching sites. The pools and scrapes attract water birds in their thousands, and no matter what the season, there is always something to see. 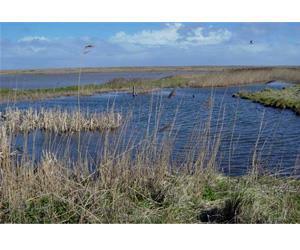 NWT Cley Marshes: Perched on the north Norfolk coast, NWT Cley Marshes has a well-deserved reputation as one of the UK's best bird watching sites. The pools and scrapes attract water birds in their thousands, and no matter what the season, there is always something to see. The brand new environmentally friendly visitor centre incorporates an observation area, interactive interpretation including a remote controllable wildlife camera, a café and sales area. Four hides (with excellent wheelchair access) provide bird watching within metres of the pools where the birds congregate. Audio trail. Wildlife Detective Bumbags for children are free to hire. Boardwalk and information boards. Reserve leaflet.